Exposure to blue light before bed is bad for your sleep. 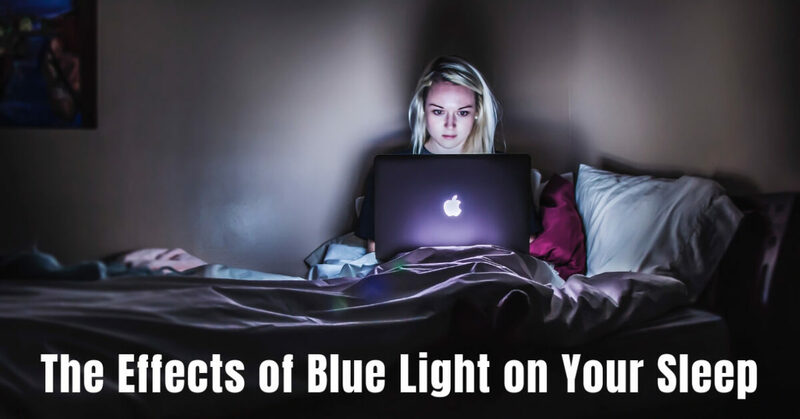 Unfortunately, in our modern age of technology we’re often exposed to a lot of blue light in the evenings from our overhead lighting, as well as our TV, phone, and computer screens. Even if you’re spending a quiet evening at home reading, you’re still exposed to a lot of blue light, either from your reading lamp, or from the screen of your e-reader. Scientists are warning that we need to change our evening habits and avoid blue lights if we want to get a good night’s sleep. Blue light, like the light coming from your phone or TV screen, is called “short-wavelength-enriched” light. This means it has a higher concentration of short light wavelengths, like blues and purples. This light is important for our circadian or sleep and wake cycles, and is present in sunlight. Blue light signals to our brain that it’s daytime, and helps our bodies wake up. While this is extremely important in the morning, at night blue light can keep you awake by tricking your brain into thinking it’s still daytime. Blue light affects the production of the hormone melatonin, which is critical for getting a good night’s sleep. Naturally, melatonin is present throughout the day, but begins to increase a few hours before bed, and reaches peak levels around midnight. In the morning when the sun comes up, your brain stops producing melatonin, promoting wakefulness, and signaling you to get up. However, our lightbulbs and computer screens emit a lot of blue light, and in the evening, this can actually inhibit melatonin production, keeping you awake long into the night, and preventing you from feeling sleepy at bedtime. When our natural circadian rhythm is upset, not only do we have trouble falling asleep and experience higher alertness before bed, we’ll also have less REM sleep at night, feel sleepier in the morning, and have a harder time waking up. When we think about being healthy, we often focus on diet or exercise and overlook the importance of getting a good night’s rest. The truth is, you can have the healthiest diet in the world and go to the gym every day, but if you’re not getting adequate sleep you’ll never be healthy. Sleep is critical for optimal health and wellbeing, protects organ function, keeps your heart strong, and reduces your chances of diabetes and depression. Resting at night gives the body a chance to recuperate, and have energy for the next day. Sadly, we’re sleeping far less than we used to, due in large part to all the light exposure in the evenings. To get a good night’s sleep, the best thing you can do is to reduce your blue light exposure in the evenings. Install yellow or red lights in your house so that in the evenings you and your family aren’t sitting under blue light. It’s recommended that you turn off all electronic devices at least one hour before going to bed. We know it can be hard to turn off all your digital devices, but there are other ways of reducing blue light. Dimming the screen brightness on your devices reduces blue light, and there are many red filters you can place on your screen to block blue light and help you fall asleep easily. Many computers come with night-time settings, and you can set it to automatically apply red filters at a certain time of the evening to block harmful blue light. If you’re reading an e-book instead of a print book, try reversing the print in the evenings, so the page is dark and the text is light, as this will greatly reduce the amount of blue light you’ll be experiencing. If you’ve been having difficulty sleeping at night, visit us at Sound Sleep Medical. We have more tips for reducing blue light before bed, and can help you transform your sleep. We’ll also explore other reasons you might not be sleeping, such as sleep apnea or another sleep disorder. At Sound Sleep Medical, our team will make sure you’re getting the sleep you need.